Timmy Shin/Staff Photographer Robbie Cohen, executive director of Harpur?s Ferry, greets an evacuee at the Events Center. Harpur?s Ferry has joined the group of organizations that work to help victims of the flood. Harpur’s Ferry, the student-run volunteer ambulance service, has played an important role in assisting victims of the flood who were evacuated to temporary shelters at the Events Center and the West Gym, according to University and Red Cross officials. 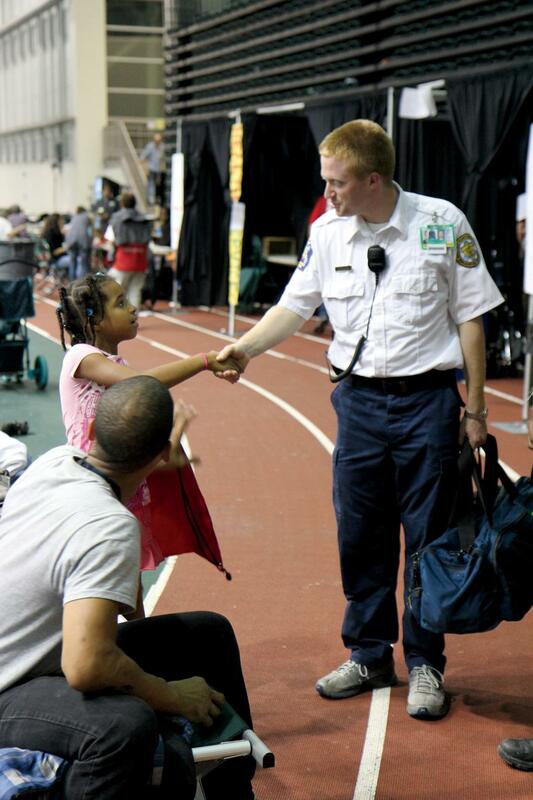 The student ambulance corps worked to aid ill flood evacuees at the Events Center while still performing its regular rounds and responding to emergency calls throughout the day. Robbie Cohen, the executive director of Harpur’s Ferry, was informed of the events happening in the area around 4:30 p.m. on Wednesday, Sept. 7, and rushed to the Events Center to help begin preparing the shelter. “[Harpur’s Ferry] decided that since the Events Center was going to be used as a shelter, that we should move our operations [there] entirely,” Cohen said. Harpur’s Ferry commanders asked their members to come by 6 p.m. to the Events Center. They answered the call without knowing how long they would be required to stay at the Events Center. “We were told to pack for three to five days, but now it’s day 10 or 11,” Cohen said. On the night of Sept. 7, hundreds of people moved into the Events Center in response to flood warnings and evacuation orders. By 3 p.m. on Sept. 8, the Events Center had officially reached its maximum capacity of about 1,600 people. About 50 members of Harpur’s Ferry contributed to the flood relief efforts, working with the American Red Cross and volunteer EMTs from SUNY Oneonta and SUNY Cortland. Harpur’s Ferry normally receives about 900 calls per year, but the ambulance service has already responded to more than 240 calls in the past 10 days. Many of the senior members of Harpur’s Ferry, including Deputy Director Alex Nello and Captain Kate Olofson — both seniors majoring in biology — agreed that they gained more experience in those first four days of the flood than in the rest of their four years’ membership in Harpur’s Ferry. “From a training perspective, it’s been really, really good for us, just to get our providers exposed to different situations and scenarios,” Nello said. Olofson said Harpur’s Ferry members were called to attend to a woman who was not breathing at 1 a.m. Friday Sept. 9. They found she didn’t have a pulse, performed CPR and defibulated her successfully. She is now in a hospital Intensive Care Unit, alive. This “save” is one of only three in the 38-year history of Harpur’s Ferry. “Without a doubt, [that was] one of the most exciting moments of my life,” Nello said. Pavel Antonov, the second assistant chief or Harpur’s Ferry and a senior majoring in biochemistry, concurred. Jennifer Larson, public relations coordinator for Harpur’s Ferry, said the emergency has made Harpur’s Ferry a closer-knit team. Harpur’s Ferry is still currently on the scene at the Events Center assisting individuals and families until further notice. — Moktar Jama contributed to this report.